The Eradicator frees Mongul from the Black Mercy hallucination that Superman left him in and offers him a spot on the Superman Revenge Squad. Back in Metropolis, Lois and Clark look at an apartment and after discussing the pros and cons of leaving Hamilton County they decide to take the place. Meanwhile, at Superman's secondary Fortress in the Himalayas, Mongul, the Eradicator and Blanque search for the Oblivion Stone. They are confronted by two aliens staying at the Fortress but they prove to be no match for the trio of villains. Clark receives the signal that something is happening at the Himalayan Fortress and is shocked to find that the Fortress has been destroyed and that Klon and Dratania, the two aliens, are dead. He kneels before them and pays his respects before swearing that whoever did this is going to pay. Elsewhere, on the moon base that the villains have taken over, Mongul pitches a fit and demands that Hank Henshaw bow down to him. 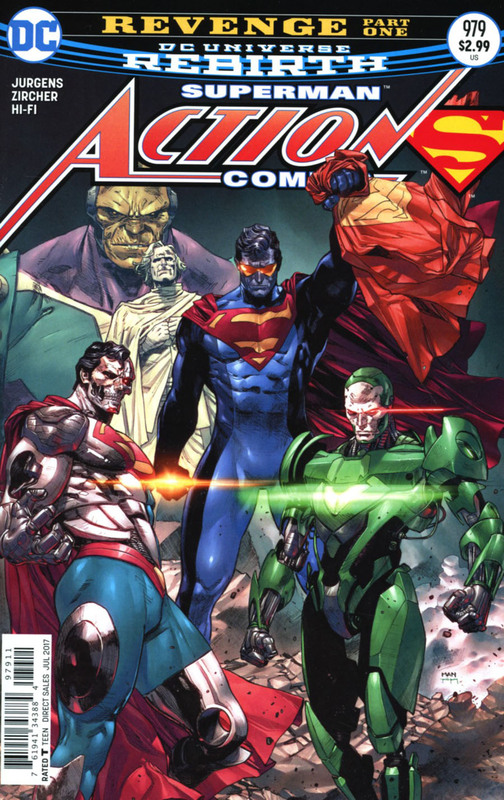 Henshaw reveals his true form, that of the Cyborg Superman, and after bringing Mongul to heel he reveals that their next objective is to release General Zod from custody. Story - 5: Weird aside right at the beginning; when I opened this comic, and saw the story title was "Revenge" I immediately started humming the number of the same name from the musical, "It's a Bird, It's a Plane, It's Superman". If you are unfamiliar with that show, "Revenge" is sung by Dr. Abner Sedgwick and relates all of the times he lost out on the Nobel Prize for science despite his genius. It's a fun number and if you have never listened to it I suggest checking it out. It's difficult to put the emotions I'm feeling right now into words because this comic made me feel like I did back when I first started reading the Superman titles. The artwork is contemporary and the writing feels right at home in the current landscape but the overall feeling of the book is that of a classic Superman story that will grab readers, new and old, and show them how amazing the Man of Steel and his friends and foes can be. The big reveal of this issue is obviously the fact that Hank Henshaw is once again the Cyborg Superman. I'm happy with this turn of events but at the same time I must admit that it was a little weird. I was intrigued when it was revealed that the Cyborg Superman of the New 52 was a transformed Zor-El and the writers that dealt with that version of the character did a good job of selling the idea but it always struck me as making the best of a poor situation. The only reason I'm not jumping up and down about the reversal is that it makes the first story arc of the SUPERGIRL series that began after REBIRTH feel weird. It's strange to have to discount a story that happened a few months back during an era designed to fix the problems DC had been having. It's not a deal breaker and I'm not angry or even upset. It's just kind of weird but I've been happy with everything Jurgens and Tomasi and Gleason have been doing with Superman so it's easy to move past that feeling. The introduction of Mongul in this issue was fantastic. Part of me feels like the Black Mercy has been overused with that character but it works to bring him into the Squad. I liked how arrogant Mongul was throughout the issue until that final page where Jurgens and the artist recreated the final page to Superman #80. Normally these "getting the band together" issues can be kind of dry but between all the small character moments with Mongul and Blanque and that ending Jurgens made this the perfect warm up to what is shaping up to be a fun and exciting storyline. More than anything I loved the short scene with Lois and Clark looking for an apartment. There are those that believe that a married Superman doesn't work but as with most things it all depends on the creators involved. Jurgens was one of the writers that got the two of them married back in the nineties and he hasn't lost a step when it comes to making them one of the best couples in comics. I liked that they were concerned with how Jonathan would adjust to city life after spending his first ten years in the country and on an extremely nerdy level I liked how they discussed how the apartment would work for Clark changing to Superman. This is one of those things that have been missing from Superman over the past decade and it's great to see it back. Art - 5: Patrick Zircher is fast becoming one of my favorite Superman artists. Not only is he a good match for the stories that Jurgens is telling but his Superman has an iconic feeling to it. It is great that he now gets to dig into more of Superman's world by drawing the Man of Steel's rogues gallery. His Mongul is huge and powerful without being over the top. His Eradicator is classic as is his Cyborg Superman. I had a huge smile on my face when he recreated the final page from SUPERMAN #80 for the final page of this issue. All of that and a shirt rip too. Definitely a favorite issue from this run. 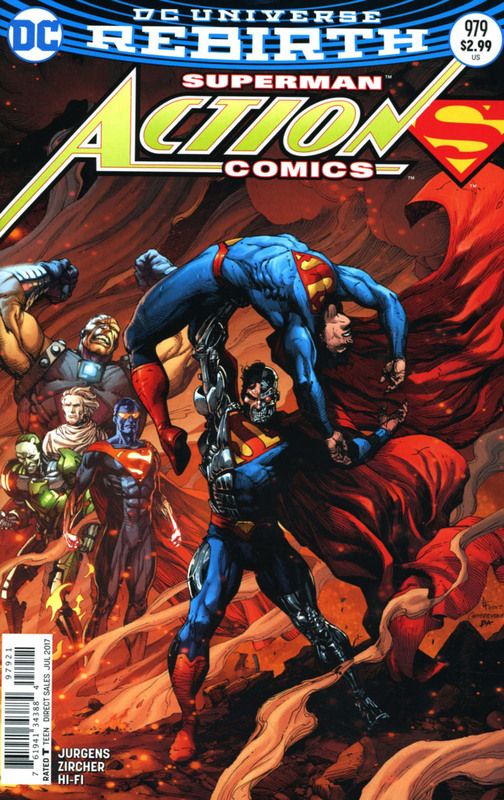 Cover Art - 5: The great thing about this cover is while it has the Cyborg Superman on it the big reveal isn't spoiled. I have been going on and on about how great it is seeing Superman's rogues being treated as viable characters and that's not going to stop anytime soon. Seeing them all here is amazing. I'm not completely sold on Metallo's new design but I'm sure it will grow on me. Variant Cover Art - 5: No complaints here. Gary Frank nailed this cover. His Cyborg Superman had a Grummett feel to it and I liked the subtle things he did with the Eradicator.